This was my first week back at school, and boy did I notice it. There has been a lot of studying done this week, and also a lot of planning of future studying, as you will see in the pictures below. Basically, this week I have been a tiny bit stressed. 1. I started a study schedule for the time before my mock exams. 2&3. 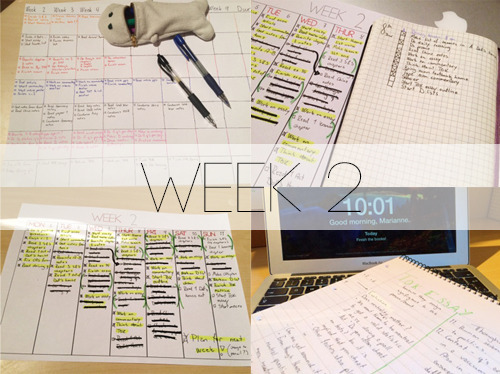 I am now also making weekly study schedules and as you can see, they are a mess. 4. My productive start to the last day of the week. I started school again on Tuesday, and overall it has been quite a nice week. I have time off in two subjects these week, so my school weeks are actually 8 hours shorter than usual, which gives me some very needed time for my studying. This week I got to know there there has been a change in our time schedule, so I’ll no longer have the opportunity to go for coffee with one of my friends on Tuesdays, like we have done for a while now, and that makes me really say. Oh well, at least I got the compensation of my Tuesdays being an hour shorter. I’m still driving, and this week has been no different. Hopefully I’ll soon get my license, and I can stop worrying about the damn driving. I am so tried of the whole thing. Next week I have a job interview, at a local ZOO of all places. Oh well, that’ll be exciting, I guess. So I have spent some time stressing and preparing for that. I really need a job with the enormously long summer break I’ll have this year. Also, the Norwegian currency is worth next to nothing right now, so my education the next few years just got hella expensive. I need a job this summer, let’s just leave it at that. On Thursday we got information on this essay we’re writing for our Theory of Knowledge class, which I detest, and I’ve now started working on it. It is an essay on whether neutral questions exist. Like why. Oh well. My planning is at least going pretty well, so I am more optimistic than when I started. Not that that is hard to be, but you know. How have you guys’ week been?